Is this Apple’s new iPad Pro? We have heard lots of rumors about Apple’s new iPad Pro tablets, the devices are said to come with an almost bezel free display, no home button and no headphone jack. We are expecting two different sizes of Apple’s new tablet, one with a 10.5 inch display and the other with a 12.9 inch display, the two tablets are said to come with the same resolution as the existing tablets. 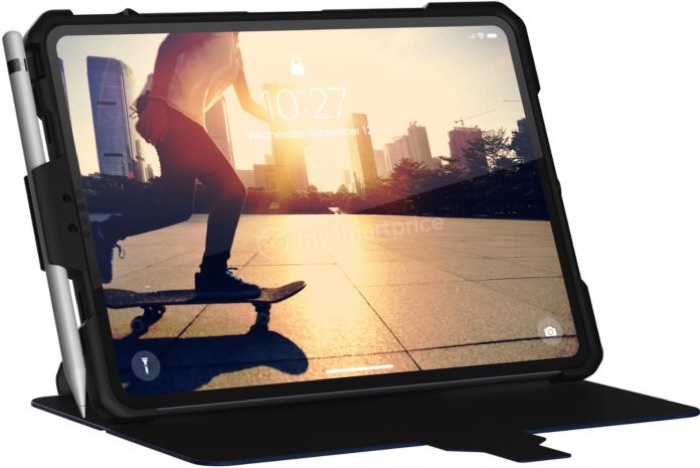 The picture above was posted online by Mysmartprice and it apparently shows the design of Apple’s new iPad, the tablet is in a case as we can see in the picture. The photo apparently shows the 12.9 inch iPad Pro. As we can see from the picture, the tablet does not appears to have a notch, instead it features a slim bezel all the way around the tablet and it appears that the Face ID technology is hidden in this bezel on the left. Apple’s new iPads are also expected to get a number of other upgrades, this will include a new modified version of their A12 processor from the iPhone X, plus more RAM than the previous models and also new cameras. Apple are expected to make their new iPad Pro tablets official some time this month, we are also expecting to see some new Macs at their press event. We are hoping this event will be made official some time this week.